Popcorn in all it’s salty goodness is a staple around here. If I could, I would eat eat it every single day. I am not a huge fan of the microwave variety, but I prefer to pop my own on the stove top. If you’ve never done it, I suggest you stop what you’re doing right now and get to it. It is super easy, and unbelievably good. Grab a big heavy pot with a lid, add in one quarter cup of vegetable oil and one half of a cup of popcorn kernels. Turn on your stove,put the lid on the pot, and get your hot pad holders on. While its cooking you need to gently shake the pot back and forth over the heat. 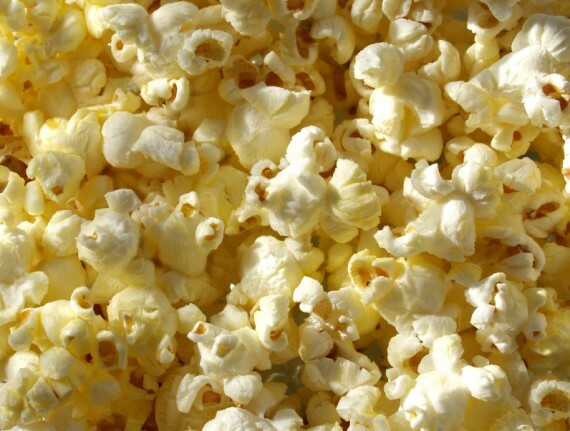 After a few minutes you will be rewarded with fluffy pop corn. Add a tablespoon of melted butter and a pinch of salt and you have a killer snack. If you’re like me though, you might want to spice things up a bit every now and again. Caramel corn, honey corn, and kettle corn are some of my favorites. I even enjoy mixing in some chocolate chips for some sweetness. But, sometimes nothing in the world is better than peanut butter. And peanut butter popcorn is fantastic. Sweet, salty, creamy, crunchy. Yum. Pop yourself some popcorn. You will want 5-6 cups of popped popcorn. Do your best to filter out any kernels. In a nonstick pan, cook over low heat 1/2 cup of butter with 3/4 cup of brown sugar, a pinch of salt, and 20 large marshmallows. Cook until it all blends together into sugary goodness. Mix in 1/2 cup of peanut butter. I like to use crunchy for the added texture. I Stir until well mixed. Pour the peanut butter mixture on top of your pop corn and quickly stick to coat it all. Let it cool, then devour it. Or eat it slowly, and savor it. Either way this is one that you will come back to again, and again.